I'm sorry for the messy, poorly lit photo above. This is a pretty realistic portrayal of my brain right now, which is to say scattered. This is one of those recipe's born from desperation. 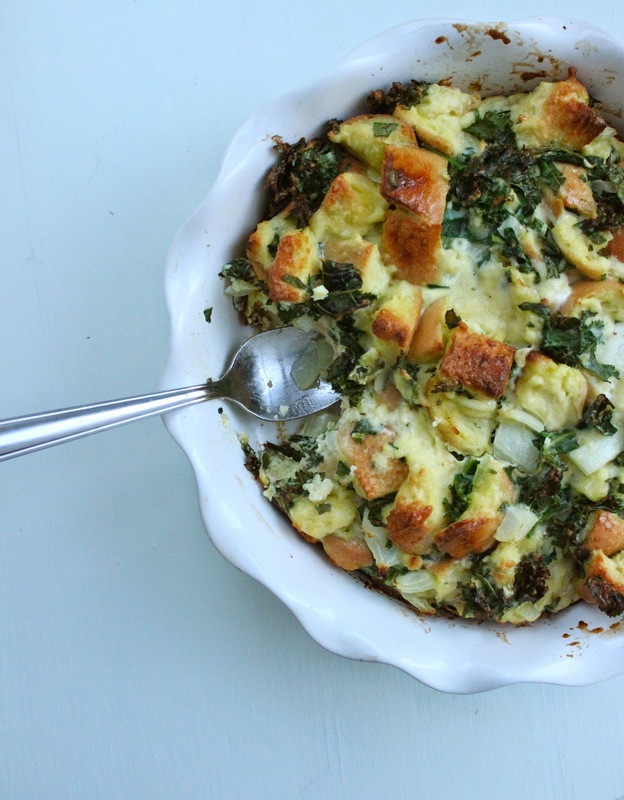 I'm calling it "Lazy Girl's Spinach & Kale Strata" because it is so dang easy to make even my lazy self can do it. Any-who, I created this easy strata during exam--time last spring. I came home and was STARVING. Adam was gone, and I was grumpy, and I wanted to eat something right now, but we didn't have any leftovers in the fridge or freezer. 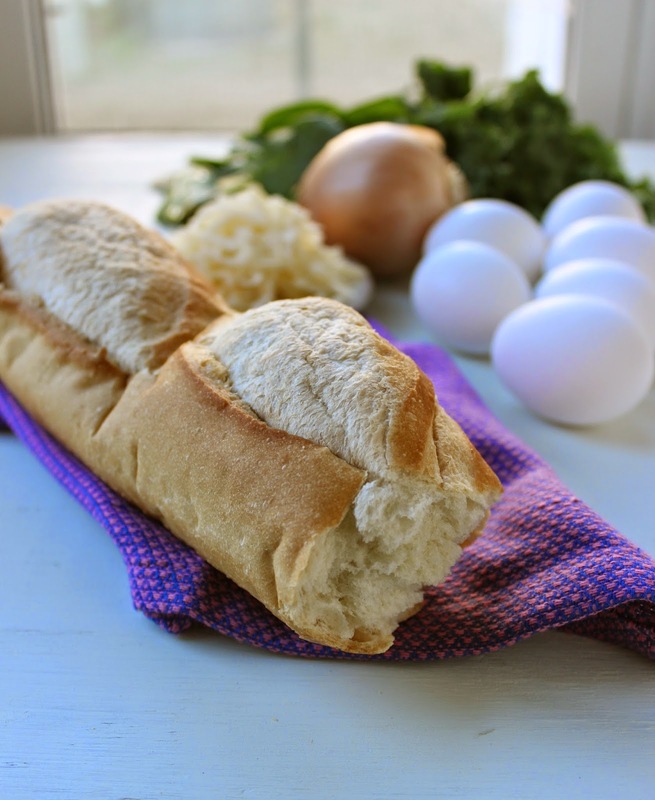 We did have a hunk of hard baguette, eggs, milk, assorted bits of cheese, half a bag of slightly wilted spinach and kale, and an onion. I was not about to spend time sautéing anything (more dishes to clean? No thanks.) so I gave everything a rough chop, mixed it all together in one bowl, and threw it in the oven. (1) You might need a quick, desperate meal like this in the upcoming busyness of the next two months. (2) This could be used as a stuffing-like dish to serve for your friends and family for Thanksgiving. This strata recipe is about as versatile as they come. Use any kind of cheese or vegetables that you like. If you've got more time, you can sauté the onions until lightly caramelized and add in the spinach and kale at the end until wilted. You could add mushrooms, or tomatoes, or fresh thyme and garlic. Let me know what you try! Preheat oven to 425. Prepare a 9 inch pie pane or 9 by 9 square pan by spraying liberally with non-stick cooking spray. Whisk together eggs and milk in a large bowl. Add bread, onion, kale, spinach, cheese, and salt & pepper to taste. Stir to combine. *If mixture looks a little dry, add another splash of milk or another beaten egg. Pour into prepared pan and cover with aluminum foil. Bake at 425 for fifteen minutes. Remove foil, then cook for an additional 10-15 minutes or until edges are brown and center is firm. What a treat for the eyes you've given us today! I've never tried spinach and kale together, always one or the other. Will try!